Kesterites are semiconductor compounds made of the elements copper, tin, zinc, and selenium. These semiconductors can be used as an optical absorber material in solar cells, but so far have only achieved a maximum efficiency of 12.6 per cent, while solar cells made of copper-indium-gallium-selenide (CIGS) already attain efficiencies of over 20 percent. Nevertheless, kesterites are considered interesting alternatives to CIGS solar cells because they consist of common elements, so that no supply bottlenecks are to be expected. 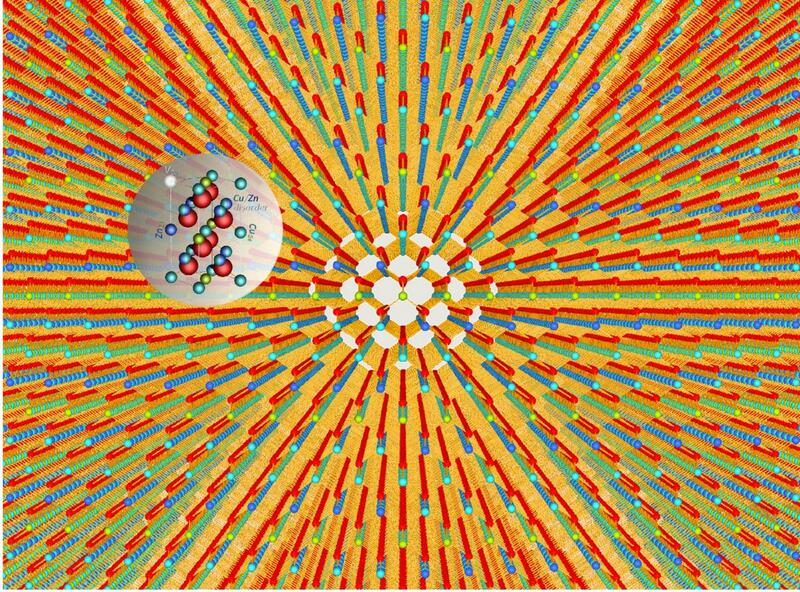 A team led by Professor Susan Schorr at the HZB has now investigated a series of non-stoichiometric kesterite samples and shed light on the relationship between composition and the opto-electronic properties. During the synthesis of the samples at the HZB, the tin atoms were replaced with germanium. The researchers then investigated these samples using neutron diffraction at BER II. Copper, zinc, and germanium can be distinguished from each other particularly well with this method, and their positions can be located in the crystal lattice. The result: kesterites with a slightly copper-poor and zinc-rich composition found in solar cells with the highest efficiencies also have the lowest concentration of point defects as well as the lowest disorder of copper-zinc. The more the composition was enriched with copper, the higher the concentration was of other point defects considered to be detrimental to the performance of solar cells. Further investigations showed how the energy band gap, as it is known, depends on the composition of the kesterite powder samples. "This band gap is a characteristic of semiconductors and determines which frequencies of light release charge carriers within the material", explains René Gunder, first author of the work. "We now know that germanium increases the optical band gap, allowing the material to convert a greater proportion of sunlight into electrical energy." "We are convinced that these kinds of kesterites are not only suitable for solar cells, but can also be considered for other applications. Kesterites acting as photocatalysts might be able to split water into hydrogen and oxygen using sunlight, and to store solar energy in the form of chemical energy," explains Schorr.